According to Ministry of Land, Infrastructure, Transport and Tourism, it is said that there are 1.29 million condominium apartments which is over 30 years old and it is estimated to increase up to 4.47 million in 30 years. Residents will get old together with the building and there will be many cases that refurbishment and rehabilitation are not possible due to the cost repair issues. It could lead to vacancy and turn into slum centering in urban areas.Imbalance of generation, aging of residents and dilapidated buildings are something that are inextricable to each other. 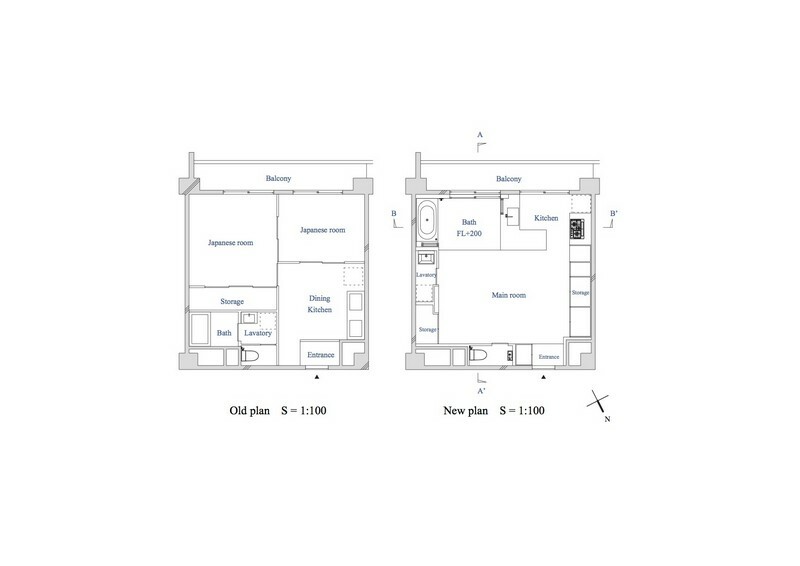 I thought by the combination of architectural efforts such as “changing the space into one room” “opening and closing by sliding doors” “multi-layered usage” and the idea of “live for a limited time frame even though its small” could change a 40m2 apartment which is thought to be difficult to deal with among real estate market in Japan, due to reasons such as “too large for single person” “too small for family” could be changed into an attractive home precisely because it’s for a family with small children. If the fact that newly built level house can be attainable at an amount of money almost same to rented accommodation, the rooms of collective housing will be updated and mixing among generation could happen. Moving in of young people is also valuable for maintenance aspect. I believe that “individulal design” with a point of view of maintenance of the whole building is essential for stock utilization. This is a house to live for ten years until the children grows up and become junior high students. We didn’t need a kid’s room so we chose a small apartment. Due to the age and size of the apartment, we were able to hold down the expense of the apartment itself and appropriate the budget for renovation cost. As requested by the client it is a one room space, with spacious bathroom and kitchen on the window side. The bathroom can be closed by doors securing privacy and waterproof property when using. 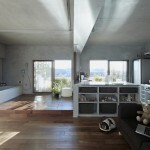 At other times it is used as the extension of the main space. By opening and closing the doors the space and the usage of the room is changed and the space is used effectively.The material of the floor is teak. Unity of material makes the space look larger.When thinking about utilizing stock apartments, I think that casual house according to various life stage can be a solution.